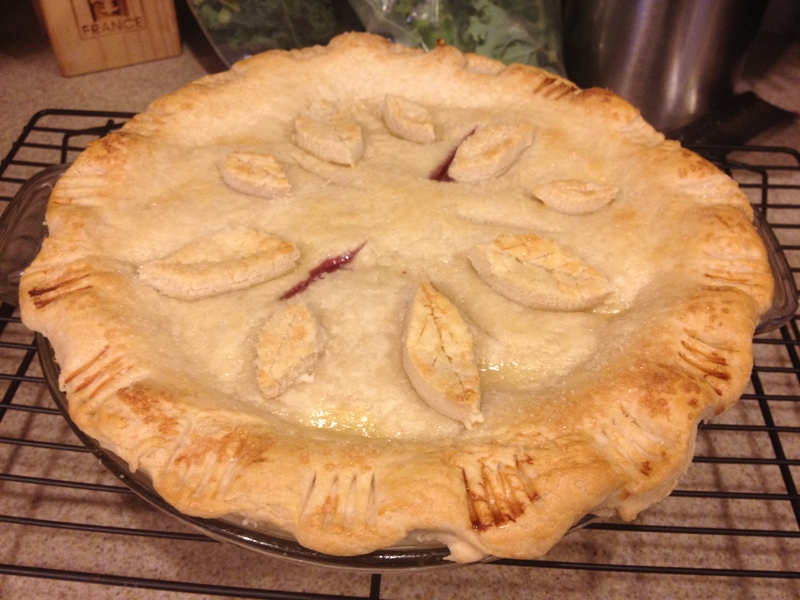 I was going to pass on this week, but since I told myself I would do my best to make each and every recipe for this go around of Tuesdays With Dorie, I knew I had to make this pie. I have NEVER been a fan of pie, there’s just the thought of fruit being cooked/baked/hot…whatever, just didn’t sit well with me. So, I’ve never made a pie, ate a pie, nothing, had no interest in a pie what-so-ever!! 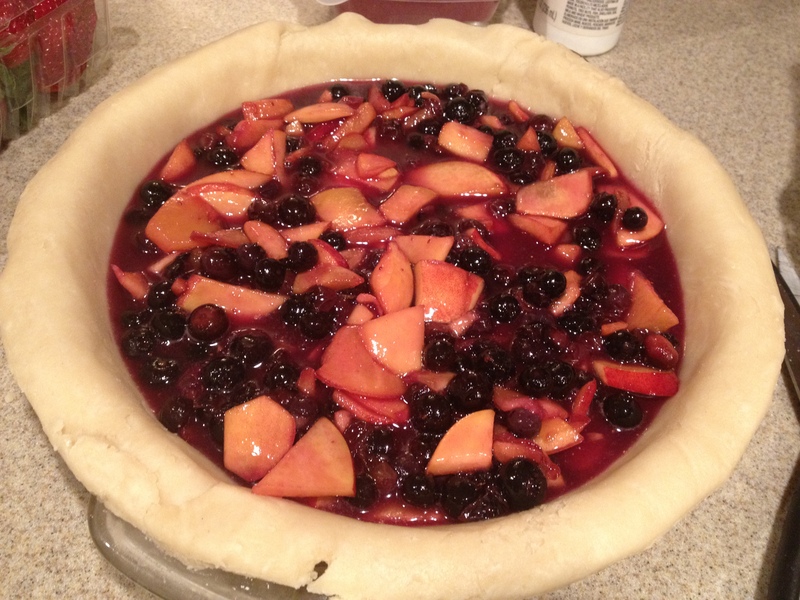 I made this to take to a 4th of July party, and actually really liked the fruit mixture (I tasted while it was cooling) and it was actually good, yes, I was a bit hesitant, and was pleasantly surprised. 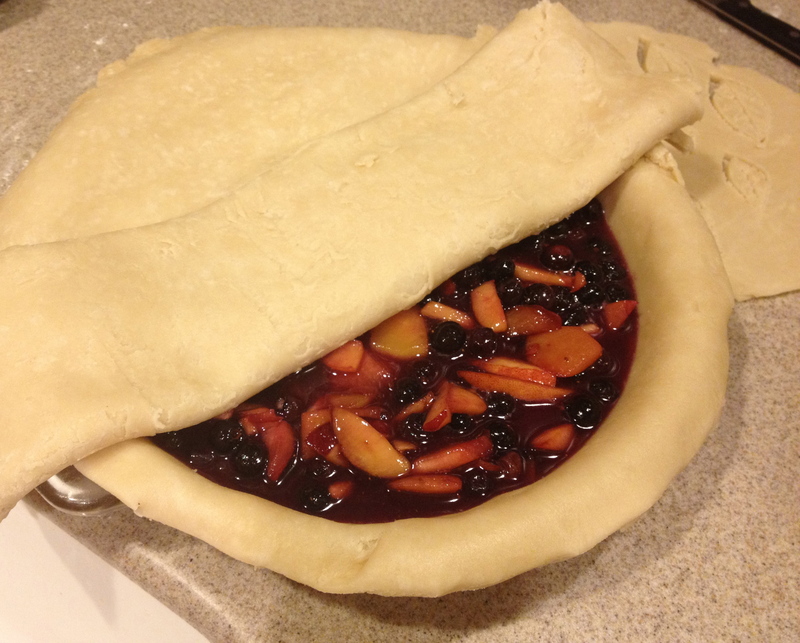 I rolled my dough out to what I thought it should be, and put the pie together, dumping the fruit right from the bowl it sat in, juice and all (big mistake), let it rest overnight and baked the next day for the par-tay! It baked beautifully, I was beginning to think I may have a new love for baking pies, as long as it passed the taste test. Once I cut into it, it just over flowed with the juices, it was super runny, and I’ll admit, I was really disappointed, what I thought was going to be a perfect pie, wasn’t holding up to my image I had. Well, it tasted great, the dough was thicker than I bess pies should be, but I loved that “meaty” dough, I had only 1 slice that night, and left the rest for everyone else to grub on. And the next day I regretted not taking a slice home. So the next weekend, I made another pie, with white peaches instead of nectarines, let the flavors after cooking them marry each other (they were so in love). 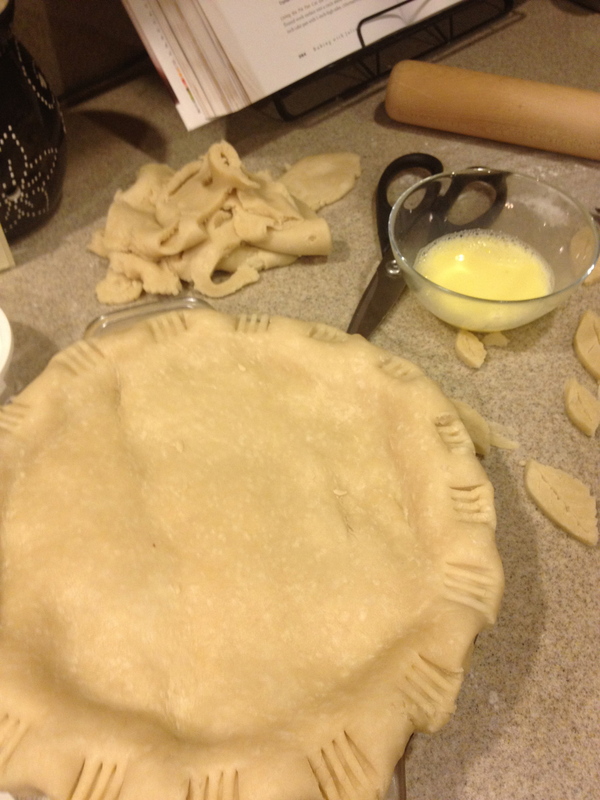 I rolled the dough out, thick again, and when I put the fruit in the pan, I used a slotted spoon to leave all those juices out, to cut back on the run the prior pie had. Baked that bad boy up, let it sit for 8-10 hours before cutting, and the results we so much better this pie around. 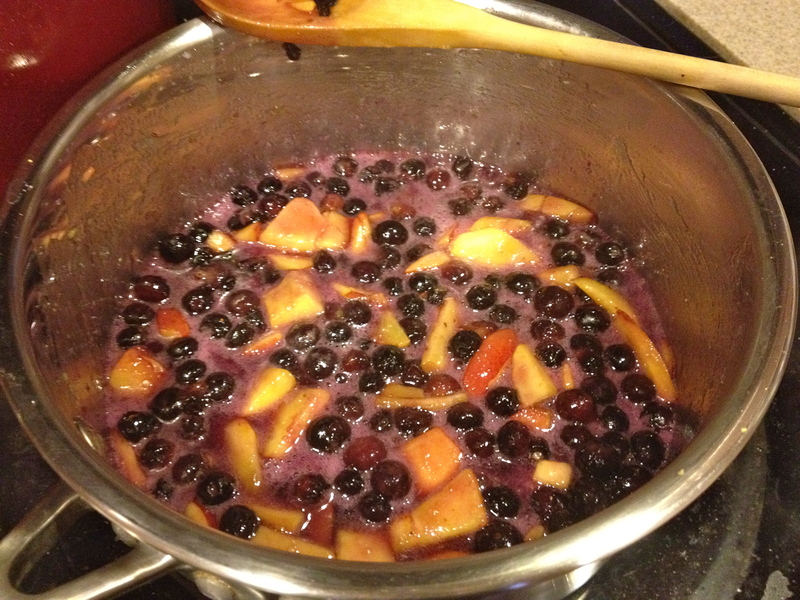 I will DEFIANTLY be making this again, I’ll use the same method and maybe change the fruit used, for variation. Go check out Hilary of Manchego’s Kitchen and Liz of That Skinny Chick Can Bake for the recipes as they were this weeks host, so thank you ladies for hosting, it was a great week, for TWD! 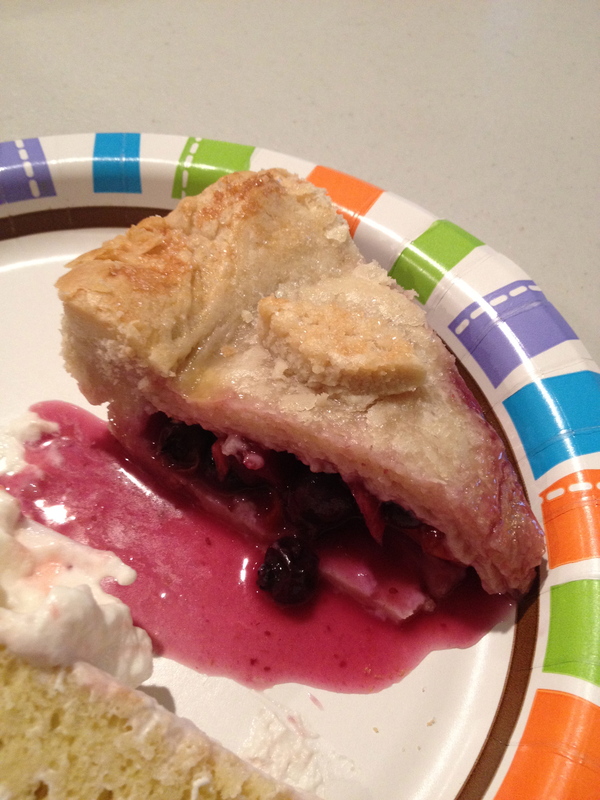 Categories: 2012, Baking, Fruit, Jul 2012, Pastry, Pie, Tuesdays With Dorie | Tags: blueberry, dough, nectarines, Pie, Tuesdays, TWD, white peaches | Permalink. I love your leaf design! Great decorations. Glad you’ve found a pie you can enjoy. Beautiful decoration!!! I wish I had thought of using a slotted spoon! How lovely! Your pie is so beautiful. Thanks for the trick on how to get rid of the “too much” juice. Congrats on baking your first AND second pie!!! 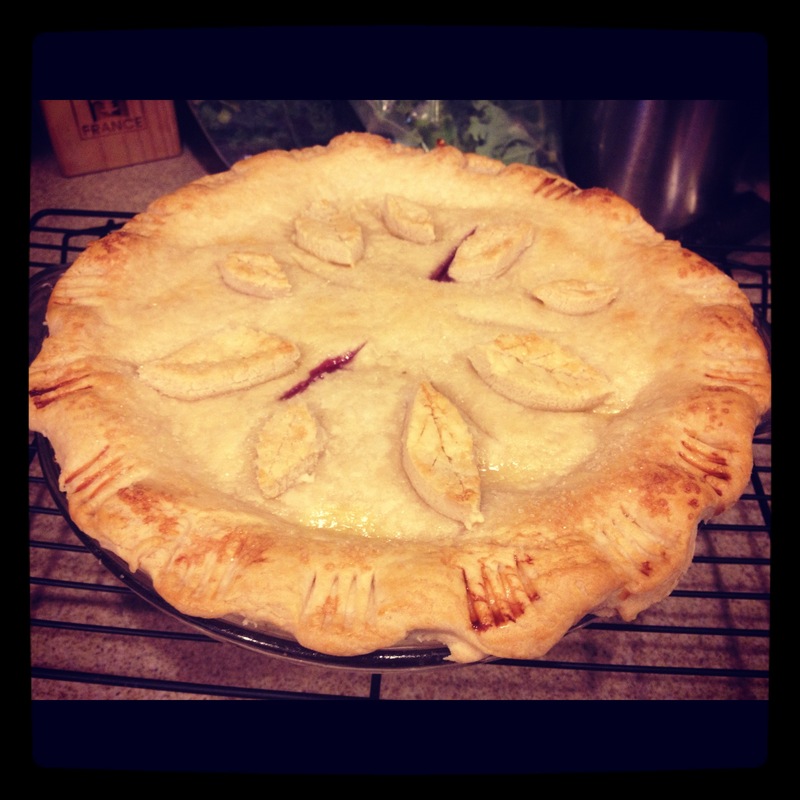 Love your decorative crust…so pretty!